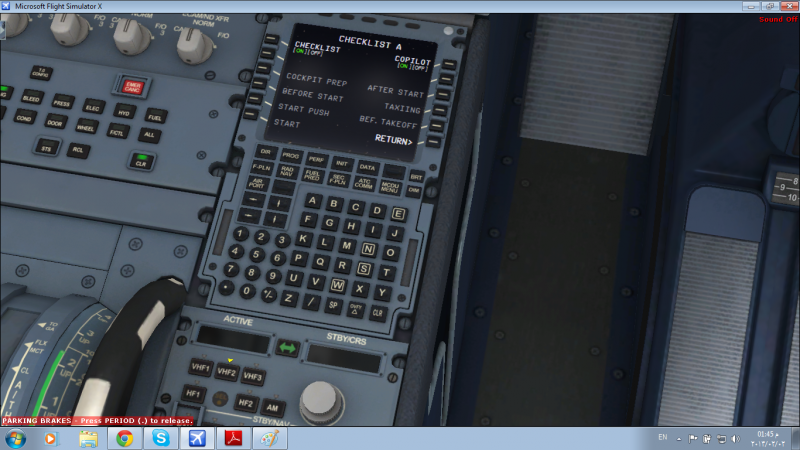 In the right MCDU, do you set "checklist on" and then select "cockpit preparation" in orange just below? parking brakes were on !! first if you load "Dark & Cold" the parking brakes are off. To start the checkklist functionality it is not necessary that the parking brakes are ON. What I get from your description is that power is available because otherwise you would not see the menu. So this is OK. The next step you should follow is to make the settings for the Checklist- and Copilot functionality on the right MCDU (please see chapter 4.6.3 of the StepbyStep Guide). Do you get thies menu? Did you do the settings? Do you then see the "info bar" on top of your screen? these pictures are after selecting cold and dark !! Not sure why Hanse said that parking brakes must be on. I'm pretty sure parking brakes must be off and doors open for the checklist to start. I even tested it to fully confirm. well what i used to do in version 1.02 is that once i enter the cockpit i just select cold and dark , and after i select the external power on , i just ask for the preparation checklist ... that is exactly what I did in v1.04 but i don't know whats wrong ,,, so setting the brakes on or off doesn't make difference cos i tried both on and off and no news !!!! Hmm... that's how I do it and it works... might be your aircraft state file is corrupt? Did you try reinstalling the bus? oooh man i installed it about 10 times till now , in every time after uninstall i was looking in FSX main folder making sure that every thing was deleted regarding to it , and then i install it again with a big hope that every thing goes ok , but unfortunately nothing fixed yet !! I really can't help you then, I'm sorry. You'll have to wait for Aerosoft support. that fine , thank you friend .. I did not say that the parking brakes must be ON. I wrote: First if you load "Dark & Cold" the parking brakes are off. To start the checkklist functionality it is not necessary that the parking brakes are ON. And one more question: Is the Infobar displayed on top of your screen and if yes does it display anything? Okay, must have missed the "not"... I'm sorry.